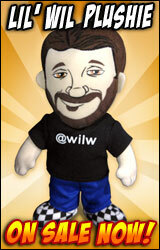 is this the end of zombie wil wheaton? The Internets worked its magic yesterday, and Dead Eyes Open creator Matt Shepherd e-mailed me this totally awesome image of your humble narrator, in all his living dead glory. Dead Eyes Open is really fantastic, and I highly recommend it for anyone who is a fan of Monster Island, Zombies!! !, Night of the Living Dead, Shaun of the Dead, or anything else in the Living Dead canon. It's very hard to bring something new to this genre, but Matt did exactly that with this book. You can buy it from Slave Labor, if you're interested. 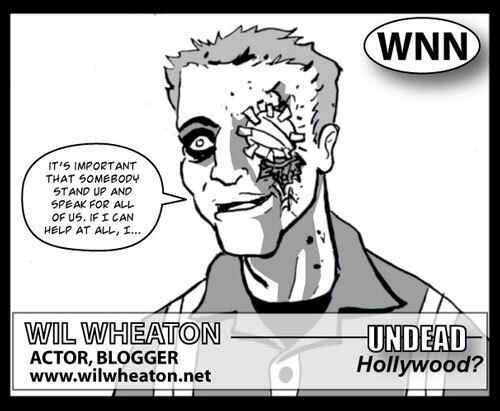 Hey, just to make this a bit more interactive, what's your favorite entry in the Living Dead, Zombie, or Undead world? Fast zombies or slow zombies? And where are those pictures I ordered? Can someone get Don on the phone?